Crude oil regained traction on Friday reaching the highest level for this year with a high of $54.14 per barrel. The rally came after Bloomberg stated that China is willing to increase its imports of US products with an aim to eliminate the trade imbalance, giving the investors a relief from the US-China trade conflict. On another positive note, the Baker Hughes report on Friday revealed that the active number of oil rigs decreased to 852 from 873, the largest decline since 2006. Furthermore, OPEC's monthly report on Thursday showed that the monthly production levels fell sharply with the additional output cuts going into effect following record high production levels toward the end of 2018. Now the focus remains on the US-China trade war with any constructive development leading to fuel Crude oil's rally. Crude prices gained traction during Friday's session and rallied as expected towards the $54 level. The price is currently hovering just below the 53.89 resistance level with a bullish momentum yet entering the overbought state. 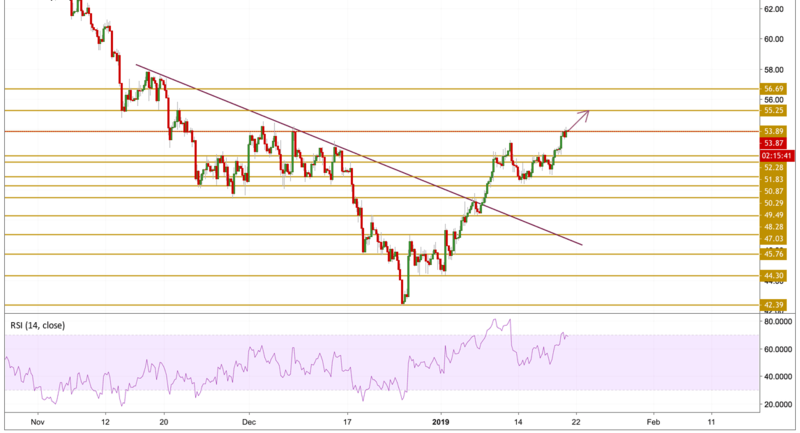 However, the price has more room to go before we witness a technical correction with our next resistance level of $55.25 per barrel being the target keeping a close attention to a potential divergence between the price and the momentum.